Windows Server 2012 Archives - Page 2 of 3 - C:Amie (not) Com! I recently wanted to explore the viability of pulling a Server RAID controller into a workstation. A few choice pieces of electrical tape to cover PCIe pins later and the card worked as intended… until it melted down a few minutes later. The inevitable failure got me thinking. Like most enterprise hardware, the PERC 5/i and 6/i do not support processor power management. The onboard processor runs at 100% speed, 100% of the time. As a result the heat that it generated easily overwhelmed the modest airflow of a desktop. The thermals went well past 80 degrees C before it tripped out. Most of the servers that we are running in one particular production stack were using the same controllers. Despite this, none of them were actually being used as RAID controllers. They were set as HBA/JBOD devices with a single drive attached – i.e. no disk redundancy. The reason why we have a production setup with such a bad design? These servers are clustered hypervisors. It doesn’t much matter if they burn out. There are 20 more to take their place and all actual client data is held within a fully redundant, complex storage network. An admin simply needs to replace the broken part, rebuild the OS and throw it back into the pool. Was changing the design of these servers feasible? Each 10,000 RPM 70GB hard drive was at best using 20GB of data – and less than 15GB in most cases. Each of those drives is consuming 15-25w of power, making noise and never sleeping. At the same time each controller is consuming 6-18w of power and again, never sleeping. Both are adding to the heat being thrown down through the backplane and out into the hot isle. All for pretty much needlessly. Based upon my domestic energy tariff, the potential per-server electricity cost saving stands to be between £3.29 and £4.38 per month. £39.48 and £52.56 per year. This does not include any residual savings in air conditioning costs. While it doesn’t seem a lot. On a cluster of 20 servers that’s between £789.60 and £1051.20 per-year. At that level the potential savings to start to add up. As an IT designer, it also gives me a budgetary value that I can rationalise any savings against. If we split the difference over 12 months between the upper and lower estimate we get a £46.02 average. If it costs more than that – particularly for old server hardware – it isn’t worth doing: so £46.02 became the ‘per-machine budget’ for my experiment. Pull the RAID controller and attempt to utilise the DVD drive SATA connector with an SSD. This would solve the heat issue, solve the noise issue and reduce power consumption (to ~4w). It will also be faster than the 10,000 RPM rotational drive. The down side is that getting hold of affordable SSD’s (as of writing) isn’t yet an option. Not to mention that various adapters and extra cabling would be required to get the SSD mounted properly (at extra cost). Modifying new cable runs into 1u servers can often be a challenge (it’s bad enough in 3u). The Server BMC also complicates matters as under Dell, OpenManage will notice that you aren’t using a Dell approved drive and this will quickly hit your environmental reporting data. Approximate cost ~£70+ per server. Well over budget. Pull the RAID controller and mount a SSD/mSATA/m.2 into a PCI-e slot (even potentially the RAID controllers slot) on a PCIe adapter. This solves the cabling problem and has the added advantage of clearing both drive slots. It also means that I can control the bus specification, potentially getting a boost from a SATA III or NVMe controller. Of course this is more expensive although it is easier to get hold of smaller mSATA SSD’s than it is 2.5″ ones. Cost per-server ~£125+. Again, over budget. Look at SATA DOM or booting from Compact Flash/SD Card. SATA DOM isn’t an option for the PowerEdge 1950 and a NAND flash solution would require modification of the chassis. The headache of managing boot support would also be an issue. Rending this unreaslistic. Pull the RAID controller, disk and boot the entire enclosure from USB. This solves pretty much all problems but does add one in that these servers do not have an internal USB port. The active OS drive would therefore need to be insecurely exposed and accessible within the rack. Think malicious intent through to “I need a memory stick… ah, no one will notice if I use that one”. The cost of an average consumer USB 3.0/ 16GB USB Flash Drive (UFD) is about £7 – and it just so happened that operations have boxes of new ones lying around for the pilfering fully authorised, fully funded project. I decided to experiement with option 4 and started to investigate how to boot Hyper-V from USB. Running Hyper-V Server from a UFD is a supported mechanism (as long as you use supported hardware types and not a consumer off the shelf UFD like I am). The main Microsoft article on this topic was written for Hyper-V Server 2008 R2, however a set of liner notes with hardware recommendations are also available for 2012/R2. So far, so good. The basic premise is that you use disk virtualisation and the Windows 7/8 boot loader to boot strap the operating system. The Hyper-V Server is installed into a VHD and once the boot loader mounts the VHD and loads Windows as if it were any other Virtual Machine. The performance will suffer, but for Windows Server Core, this really doesn’t matter. Microsoft states that USB 2.0 or higher must be used and that (for OEM redistributors) the UFD must not report itself as being ejectable. The closest that I could find were 16GB Kingston DataTraveler G4’s. Based upon UserBenchmark data offer 45% lower performance vs. the DataTraveler Ultimate G3 and 131% lower write speeds. Similarly, USB3Speed reports that the G4 read/write is 102.86/31.48 MB/second on a USB 3.0 bus vs. 174.76/38.46 for the Ultimate G3. So there is a decisive bottle neck being introduced as a result of using a cheaper UFD model. The Microsoft article recommends the use of 16GB UFD’s rather than 8GB ones to allow for the installation of future updates I grabbed 4x 16GB DataTraveler G4 sticks and proceeded to prepare them to support the boot process. The Microsoft article states that USB 2.0 is supported for Hyper-V Server USB Booting. I confirmed through empirical experimentation that the PowerEdge 1950 does support USB 2.0 and that its firmware supported booting from USB in a reliable, consistent way. What I mean here is that you don’t want to have to go into a F12 boot menu every time you restart the server because the BIOS/UEFI will not automatically attempt to boot from the USB port. You should – as a matter of course – update your server firmware, including (but not limited to) the BIOS/UEFI as a way to mitigate against any potentially solvable issues in this regard. Do remember however that in a clustered environment, you shold normalise your hardware and firmware setup on all participating nodes before you set out to create the cluster. In testing, the PowerEdge 1950 demonstrated that it could boot properly from the UFD without intervention. Thus with another tick in the box, the idea was looking increasingly more viable. I am not going to repeat the instructions for creating the bootable USB stick, they are clear enough on the Microsoft website. It is a shame that Microsoft closed the Technet Code Library meaning that you can no longer get access to the automated tool. What I will add is that as I was installing Windows Hyper-V Server 2012 R2, I decided to attempt to use convert VHD to the newer VHDX format. The advantages here are nominal; better crash recovery and support for 4K drives are the main headlines. Regardless I wanted to start with the latest rather than using the VHD as prescribed in the 2008 R2 creation guide. It didn’t work. The boot loader seemed unable to read the VHDX file. Running the VHDX back through the Hyper-V’s disk editor and into a VHD did however work. After some testing, I discovered that the issue was in the issue was the VHD migration process. To use VHDX you must update the BCD using the Windows 8.1 version of BCD edit and start with the Windows 8.1 boot loader. Repeating the process from scratch in a native VHDX did however result in a bootable OS. 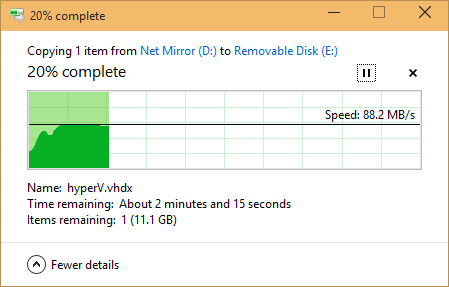 I had initially started testing Hyper-V Server on an 8GB UFD. During the process and having obtained a 16GB drive, I decided to expand the size of the VHD from 7 to 14GB. This was a mistake. The VHD will expands fine, however Windows will not allow you to resize the VHD’s primary partition to fill the newly available space via the GUI or DiskPart. So unless you have access to partition management tools that can work with a mounted VHD(x), you will need to ensure that the size of the VHD is correct when you create it. The file copy from the management computer onto the UFD of the 14GB VHD file (with write cache enabled) was excruciating. Making around 12.8MB/s from a USB 2.0 port is was getting far less than the benchmarked speed of 31MB/s. I also copued the x86 version of a Microsoft utility called dskcache.exe into here. dskcache can be used to enable/disable write caching and buffer flusging on connected hard drives. You could directly inject these into the VHD if you wanted to, however if left on the UFD, they are servicable. Also note that this is your best opportunity to inject drivers into the VHD should you have any special hardware requirements. Despite the Microsoft article stating that USB 2.0 is supported, it became obvious within about 20 seconds of the boot process that something was not right. The time that it took to boot was agonising. Given the poor sustain file write speed shown above, this shouldn’t be overly surprising. It took well over 60 second for the boot loader itself to start booting, let alone bootstrap the VHD load rest of the operating system. The initial boot time was about 25 minutes – although does have to go through OOBE and perform the driver and HAL customisation processes during the initial boot, so it isn’t very fair to be overly critical at this stage. The next point of suffering was encountered at the lock screen. On pressing Ctrl + Alt + Del, a 15 second delay elapsed before the screen refreshed and offers the log-in text fields. After resetting the password and logging on, the blue Hyper-V Server configuration sconfig script took around 90 seconds to load. In short, the system was painfully unresponsive. I had expected it to be sluggish – but I was not expecting it to be quite this bad. Windows had loaded the UFD’s VHD file with the write cache enabled but buffer flusging (‘advanced features’) disabled. I thus used dskcache.exe to enable both settings. The boot time was around 4 minutes, the Ctrl + Alt + Del screen was still sluggish as was the login process – but it was certainly faster. Having completed the first Windows Update run, boot times to a password entry screen had reduced to a far more respectable 1 minute and 17 seconds. The sluggishness (while still there) had again reduced to 10-15 seconds from log-in to sconfig. While the VHD upload process was a linear one that consisted of a single large file, the operating system will be making thousands of random seeks and random small writes. Random I/O and Linear I/O always offer different statistics – the latter being more synthetic than real world usage will otherwise offer. 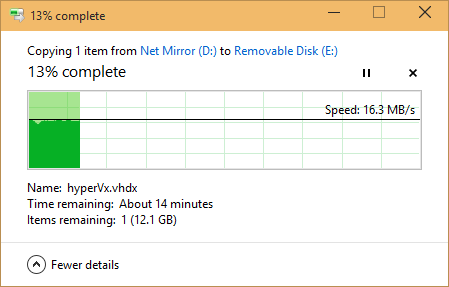 As I mentioned previously, my original test with Hyper-V Server 2012 was on an 8GB UFD with a 7GB primary partition. After install, Hyper-V Server 2012 R2 consumes 2.98GB with no Page File. By the time Windows Update had scanned, downloaded attempted to install updates – including the 870MB Windows Server 2012 R2 Update 1 (KB2919255) – there was only 154MB of free disk space available. It was unable to complete the installation as a result. Having ascertained that I could not resize the partition post-creation I recreated the VHDX once again, from scratch onto one of the 16GB. 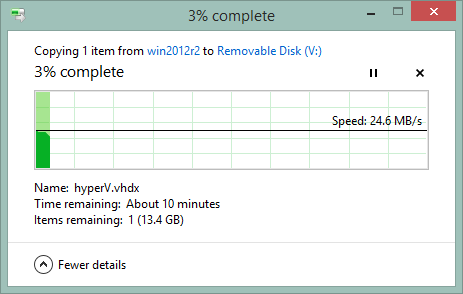 Installing the Hyper-V Server 2012 R2 into a 14GB VHD on a 16GB stick at left plenty of available disk space. By the time that Windows Update had got around to having downloaded and subsequently attempted to install all available Windows Server 2012 R2 updates, there was 4.52 GB free. At this point the Hypervisor itself still has not been configured and required support tools such as security software, Dell OpenManage or Dell EqualLogic Host Integration Tools. Therefore, as with the advice offered on the Microsoft article, do not attempt to run Windows Hyper-V Server 2012 R2 from anything smaller than a 16GB memory stick. If you do, you are going to encounter longevity and maintenance problems with your deployments. In practice you should not consider using anything smaller than 32GB. I can see a time within the next couple of years when the 16GB installation will (as with the 8GB installation) be too large to continue to self-update. This is significant and should be something that you factor during design as if Fail over Cluster Manager spots a mismatched DSM driver version (i.e. out of sync Windows Update state between cluster nodes in the case of the Microsoft driver), the validation will fail and Microsoft will not offer support for your setup. Therefore being unable to install updates is not an a situation that you want for your clustered Hyper-V Server environments. As a side note, it is worth pointing out that I ran Windows Update on the live UFD in the server while it was booted. One of the advantages of the UFD approach is that it is easy to keep a box of pre-configured UFD’s in a draw that can be grabbed as a fast way to stand-up a new server or recover a server when its existing UFD has failed. Windows Update maintenance of these UFD’s is made far easier if you use DISM to off-line service the VHD’s and apply Windows Updates to the image before you even start to use the memory stick. You can periodically update the box of UFD’s to the latest patch revision meaning that should you ever need to use one and you will have a far more up to date fresh install of the OS to hand. Something that is significantly faster than performing on-line servicing. There were three choices at this point. Abandon the project, focus on the UFD and buy the higher spec drive (£30 vs £7) or focus on the controller. Looking at prices, the controller was the cheaper option to explore. USB 2.0 is an old technology. Its maximum theoretical bit rate is 480Mbps (that’s Megabits per second, not MegaBytes). This equates to 60MB/s (MegaBytes second). If we compare this with USB 3.0 whose maximum theoretical bit rate is 5Gbps (Gigabits) or 640MB/s we can see a very clear route to better performance. In practice, USB 3.0 isn’t going to get anywhere near 640MB/s, however a quick trip to eBay revealed controller pricing of between £6 and £35 making it something that was easier to swallow inside my £46.02 budget. After researching chipset options, I narrowed it down to there being three chip options. The Etrom EJ198, which seems to have the fastest benchmark figures. The Renesas (formerly NEC) D720202 which is the new version of the D720201 which (coming in a close second) and finally the cheap and cheerful VIA Labs (VLI) 805-06 1501. After further research, I found a lot of reports of compatibility issues with the Etrom which, coupled with its higher price, meant I abandoned it. So I picked up a £6.45 VLI dual port card and a dual port Renesas card for £12.66 simply as a means to have two different chips to test with. Total spend on project: £25.91. Still well within budget. Before starting I had a working theory that introducing the USB PCIe controller was going to break the BIOS’s ability to boot from the USB port. Despite extensive research, I was unable to find any controller cards online that stated the presence of an Option ROM to explicitly offer boot support. So ultimately I may have spent £25.91 for nothing particularly as USB 3.0 may not be able to add anything to the already I/O constrained cheaper 16GB UFD; but at this point there was still £20.11 left in the budget witch was available to use if chasing USB 3.0 was a red-herring. Consequently I was able to pickup a Kingston DataTraveler Ultimate G3 for £16.99 from eBay to allow for a thorough exploration of both avenues. Total spend on project: £42.90. Still £3.20 left in the budget for a cup of tea! The first thing to note was that it is a far larger memory stick and as such is a lot more obvious and significantly more intrusive sitting on the rear I/O plane of the server. You would definitely want to internally mount this larger UFD simply to protect it from damage caused during routine maintenance and cable management activities. I elected not to re-create the experiment from scratch with a full 30/31GB VHDX, so instead I copied the existing 14GB VHDX from the existing UFD. Over a USB 2.0 bus a UFD to UFD copy resulted in a 18.1MB/s transfer speed – an immediate 5.3MB/s improvement. Repeating the file transfer from the hard drive onto the UFD increased this further to 24.6MB/s – an improvement. of 11.8MB/s and nearly a doubling of the write speed onto the UFD. Testing the connection on the Servers USB 2.0 bus, the performance difference was immediate. While still occasionally lagging and significantly slower than compared to even a 7k rotational hard drive. Its responsiveness was now at a point where I concluded that performance was acceptable – even for the USB 2.0 bus. Rolling the VHDX back to an older, un-patched version of the image and having the server self-update was a better experience; with the update process lasting for a period of a few hours rather than all day. I did however start to experience some operational problems with the higher specification drive. For example, while I had no problems with the cheaper drive (eventually) completing tasks, the DataTraveler Ultimate G3 could not complete some DISM servicing activities, citing “Error: 1726 The remote procedure call failed”. This could be illustrative of the start of a drive failure or some form of corruption in the VHD. The cheaper £6.45 USB 3.0 controller arrived first and I threw it into a PCIe 1x slot on the test system. I then retested the file copy on both the Ultimate G3 and the DataTraveler G4 to see if there was any improvement in performance. The DataTraveler G4 copied up at around the 16.3 MB/s mark, this is a 3.5 MB/s improvement over the 12.8 MB/s off of the USB 2.0 controller but nothing compared to the 24.6 MB/s of the DataTraveler Ultimate G3 on the USB 2.0 controller. 88.2 MB/s, some 63.6 MB/s faster than the same drive on the USB 2.0 bus – some 705.6 Megabits per-second. Not bad for a £6.45 VIA Labs chip from eBay! As anticipated however, the lack of an OptionROM was the downfall to the experiment. The BIOS was unable to ‘see’ the USB 3.0 controller as an add-in device during POST and thus was unable to boot from it. I attempted to create a dual USB boot solution where the VHDX file lived on a memory stick attached to the USB 3.0 bus. A second memory stick containing the boot loader existed on the motherboards USB 2.0 port. Sadly however no amount of tinkering could get the system to link one to the other. 'No bootable device -- insert boot disk and press any key'. The second, more expensive Renesas USB 3.0 controller arrived around a week later. Just as with the cheaper VIA Labs controller, there was no possibility of getting it to boot directly either. Writing onto the cheaper DataTraveler Ultimate G4 using a Renesas driver actually managed a throughput of 19.3 MB/s. Repeating the test with the DataTraveler Ultra G3 yielded a write speed of 93.0 MB/s, again showing an improvement over the VIA. Be it a not particularly significant one given that it was double the price. In summary the write speeds for performing the large file transfer of the VHD onto the memory stick are shown below. From a subjective point of view, the use of the DataTraveler Ultimate G3 on the USB 2.0 bus was “acceptable”. Acceptable given what the system needed to do. Thus the randiom read/write bottleneck can be conculded as being in the memory stick and not the controller itself. Update 08/04/2019: The VIA controller only lasted around 6 months before it started causing system instability (blue screens). Shortly there-after it died. The Renesas controller is still going strong! So having spend £42 on the experiment, what can conclusions can be drawn. In the real world most of us don’t work for Google or Microsoft and we cannot get management to agree to write blank cheques. Neither can most start-ups, home lab builders, ‘hand-me-down’ dev-test environments or backup environments. The short of it is if you want to save some money, reduce heat and in turn reduce noise (always useful in a home environment). A £40 – £50 saving a year can go a long way. So spending £42 wasn’t unreasonable. USB 2.0 is ‘good enough’, especially for testing environments. There are clear performance advantages with USB 3.0, however you are going to need USB 3.0 enabled boot support to make practical use of this technology. Even if you have that, you should consider other solutions such as a small SSD or SATA DOM before considering USB 3.0. If you are in a position to add bootable USB 3.0 to your system. It is however a very viable option. The biggest headline from his process has been that not all UFD’s are created equally. The wide and varied margin between different models from the same company was surprising – espeically with both devices claiming USB 3.0 featuresets. The benchmark statistics are so stark as to prove that there is virtually no point in having USB 3.0 if you are going to use a low-end UFD. For Hyper-V Server, with the correct investment in your UFD, you can make USB 2.0 suffice for your needs and as long as you realise that it will not be as fast as a rotational drive. Despite this, if you do not reboot your envrionment very often, it might just be good enough for your requirements. For me personally, I will be getting the testing cluster migrated over to VHDX/UFD booting hypervisors. There is a cost saving rational that helps me to keep the testing devices running. On a more personal level, for home, I have created UFD devices for a couple of desktop machines that are in my lab and these have been setup as off-line nodes in my cluster. The value here is that they can become hypervisors for a short time without interfering with the OS or drives. Even more importantly I do not have to worry about multi-booting. With these UFD’s I plan on simplifying the maintenance process of the main environment so that I no longer need to have down time on my setup. Integration with server management tools such as OpenManage may be a problem for your OEM. This in turn may have an impact on support and warranty options. In summary: For the average Enterprise user on primary production kit it may not be something that you want to consider. In some use cases, such as for backup, testing or disaster recovery environments there are clear advantages. Especially if you are prepared to be creative! This article outlines a few tips to be mindful of when performing an in-place upgrade from Windows Server 2012 to Windows Server 2012 R2. Without wishing to be verbose on this one, the simple answer is that there appears to be a bug / limitation / “feature” of the iSCSI Target component of Server 2012 during upgrade that will cause you some issues. It isn’t a client issue that you will encounter. The network profiles for non-domain adapters will drop back to Public after the upgrade, altering the active firewall configuration. After the upgrade install, the Windows Firewall will inherit most firewall configuration settings from the previous configuration, however the port configurations for the iSCSI Target services will be in a disabled state, preventing your iSCSI Initiators from connecting to the service. The upgrade process will fully de-install your NIC’s, although in general most of the main configuration settings are retained and re-applied after the upgrade (IP, Net mask etc), the advanced adapter settings are not applied. In particular, and Jumbo Frame settings designed to support extended MTU’s on your SAN NIC’s will have been reset to the standard 1500 bytes. This will have a performance hit on SAN access and Hyper-V live migration performance. You should manually re-enable the Jumbo frame settings (9014 or 9000 bytes) but be aware that it will cause the NIC to drop and re-initialise when you hit apply. Update 24/02/2015: It is worth noting that the 2012 (R1) iSCSI target file format uses the legacy VHD format while new iSCSI targets created under 2012 R2 defaults to VHDX which supports larger volumes and better error protection technologies. Perhaps most important is the fact that VHDX is required to support the use of 512e/4K hard drives i.e. non ‘legacy’ 512n hard drives. Here in 2015, if you buy a drive larger than 1TB, it will most likely be a 512e/4K drive. If you migrate from 2012 R1 to 2012 R2 or to a future Windows version onto 4K disks, you will likely see a slump in performance unless you take remedial action to deal with it during the migration. My recommendation is that while you are taking down your iSCSI services to perform the upgrade, perform a VHDX migration of the iSCSI Target LUN using an offline server and swap the VHD for the VHDX before you go back into production. If you don’t do it now, you will either have to do it sooner or later or forget completely and suffer data integrity and system performance issues at a later point in time. A number of the SysInternals apps, for example BGInfo, that work fine under 2012 have small issues under 2012 R2. BGInfo has a recent update that makes it aware of 2012 R2 and IE 11 rather than reporting that the OS is Windows 6.2 running MSIE 9.0.11. Ensure that any legacy WSUS 3.0 servers are patched to SP2 with KB2828185 installed. After re-synchronising, changing the product configuration and synchronising a second time that you server can update from your existing WSUS infrastructure. Be prepared for any 2012 R2 Data Center servers to report in WSUS as Windows 2000 Data Centre however! Unfortunately you can no longer copy/paste the two cleanmgr.exe files out of WinSxS like you used to be able to do with 2008 (the store is compressed). I found that a few loops of the following will eventually remove the Windows.old upgrade cache from the root of the OS drive. :: This is very slow as it is disk intensive: run out of hours!! p.s. run each line manually, the above is not setup as a batch script and will ask for yes / no input. Several runs may be required. Don’t forget to activate against your KMS or enter your key. About 3 weeks ago, I completed the physical hardware installation of redundant NIC’s in a Hyper-V cluster that was backed onto a Windows Server 2012 server iSCSI SAN. The additional physical NIC’s were installed on the clients and communication between nodes worked as expected. The ports on the new NIC were placed into a new private address range of 192.168.100. Some were also removed from an existing multi-port NIC in the 192.168.254/24 range. A couple of weeks later it came time to change the iSCSI SAN targets on the clients to use a the new adapters to move from 254/24 to 100/24. The firewall’s were OK, ping was OK. The DNS Connection Suffix, DNS Server (or lack of) were OK and NetBIOS over TCP/IP was disabled. I could remove and reconnect the server using the original address without any problems. Without wishing to be verbose on this one, the simple answer is that it appears to be a bug / limitation / “feature” of the iSCSI Target component of Server 2012. It was not a client issue. The problem was that Windows had not been rebooted since standing up the new multi-port NIC (some 3 weeks prior). Yes, it was rebooted to put the hardware in, but once the NIC heads on the adapter had been configured it had not been rebooted subsequently. It would appear that Storage Manager in Server 2012 does not force the iSCSI Target driver subsystem to re-parse the available adapter list. The list contained a number of network addresses that were REMOVED 3 weeks ago, but none of the NEW IPv4 or IPv6 addresses assigned to the new NIC were available. Closing and re-opening Storage Manager made no difference. I sighed and being forced into unexpected maintenance on the cluster storage back end shutdown the cluster, updated drivers and firmware, cleared out Windows Update and rebooted. After the reboot, all of the new addresses were available in Storage Manager and the redundant ones had disappeared. So quite simply, reboot (or fully restart all iSCSI services).